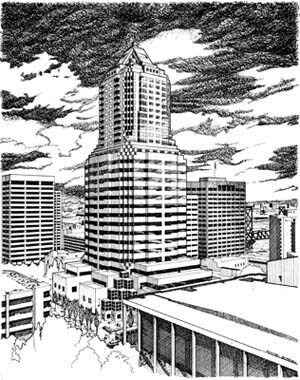 Randal admired the architectural style of this proposed skyscraper design and decided to do a line art rendition of it in the context of downtown Portland, Oregon. The building was completed in 1984 and was designed by Zimmer Gunsul Frasca Partnership (architects). It is currently owned by CommonWealth Partners of Los Angeles.